I incorporate a multidisciplinary approach to bigfoot research, drawing upon three core areas—field research, scholarly research, and data analysis. Bigfoot, needless to say, is a complex topic, with many unknowns. It is these unknowns that demand the most thorough approach available. 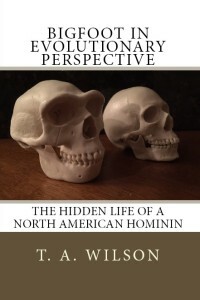 I have posted a portion of the data from my book Bigfoot in Evolutionary Perspective on this site. A subset of this data was derived from John Green’s sightings database (Sasquatchdatabase.com–note: no longer operational 2019), formerly open and freely available to anyone online, so I think it only reasonable that I should make any conclusions derived from this data available as well, together with some of the more straightforward charts and tables used to illustrate it. I have also added tables and charts based on my own research. Of course, I have conducted in-depth analysis of these topics in my book, and I am only briefly touching upon these here. While bigfoot researchers have been accused of not sharing their data in the past, and the field not advancing as a result, this is almost certainly a misnomer, whatever the temperaments of individual researchers may be. Very few researchers have anything but the most cursory of data to share and those that do oftentimes work with misapplied models, like scenarios where Giganto is the evolutionary forebear of bigfoot for example, which, by definition, can yield no data or incorrect data. Data sets like the hand casts of Ivan Marx or Paul Freeman will yield data, but what good are these if the data sets are themselves corrupt, the products of known hoaxers? Observations of hoaxers, which conform to a serial pattern of repeat encounters, can also yield data, but these must be weeded out, not elevated to play a disproportionate role in drawing conclusions about bigfoot anatomy and behavior. In the final analysis, when field research, scholarly research, and data analysis are combined, a remarkably consistent evolutionary and ecological picture of bigfoot, our hominin cousin, emerges, one that is consistent with bigfoot being placed in the hominin lineage. Scenarios of convergent evolution, such as bigfoot being a descendent of Gigantopithecus, or some other unknown Asian ape are implausible and contradict solid anthropological/evolutionary principles. Copyright T. A. Wilson 2016-19. All rights reserved.